Blogging has been sporadic around the Harris Household this month. Due partly to the many social commitments I seem to have been involved with. Lest you think I am extremely popular, these were mostly duty-type social engagements. Cooking for 25 after a golf tourny. A 90th birthday dinner three hours from home. Time spent replacing the flooring in our basement that was destroyed in our spring flood. Well, I didn't do much in the replacing department - just cooked and hosted son #2 who came for 4 days to help Fred. Then there was some fun time hanging out at Sis's cottage for a couple of days. The weather was very wet and windy so we had to do some touristy shopping - and practise my selfies. Add all those social commitments to the lack of knitting progress and there didn't seem to be enough 'news' to create a decent post. 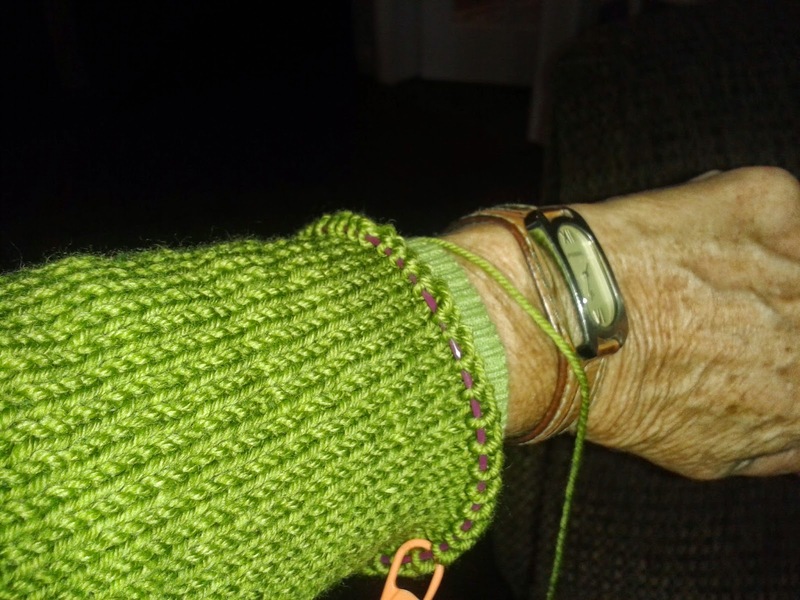 I can't believe how long it has taken to knit one sleeve of my latest project. Every night, despite a couple of hours of knitting, this sleeve has remained right here. No gain at all. I think it has flesh eating disease of a knitting nature. Knit two inches, go to bed.Those inches disappear and it is still the same length as it was the day before. Marooned, I've been. On sleeve island. I think, though that I see shore ahead. This blogger is expecting company so I will give you a quick, mostly picture post today. Ingrid's fabulous piece. Hand spun, hand knit. But where does the head go, Ingrid asked. 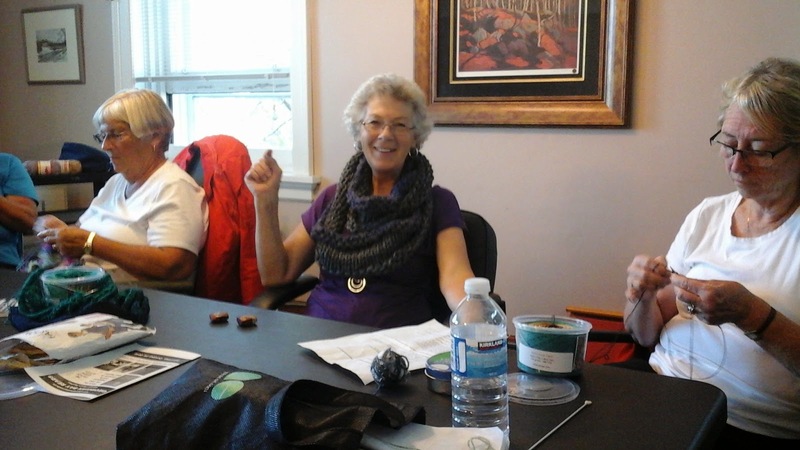 Sharon R wearing the cowl she has knit-ready to give as a Christmas gift. 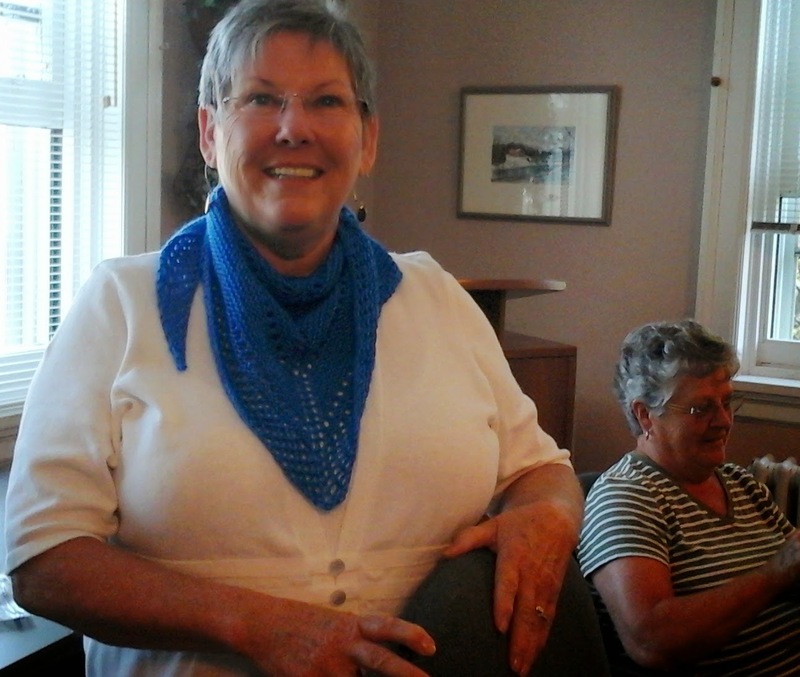 Sharon's shawl is also finished. Yarn for both these neck pieces was purchased at the Knitters Fair. 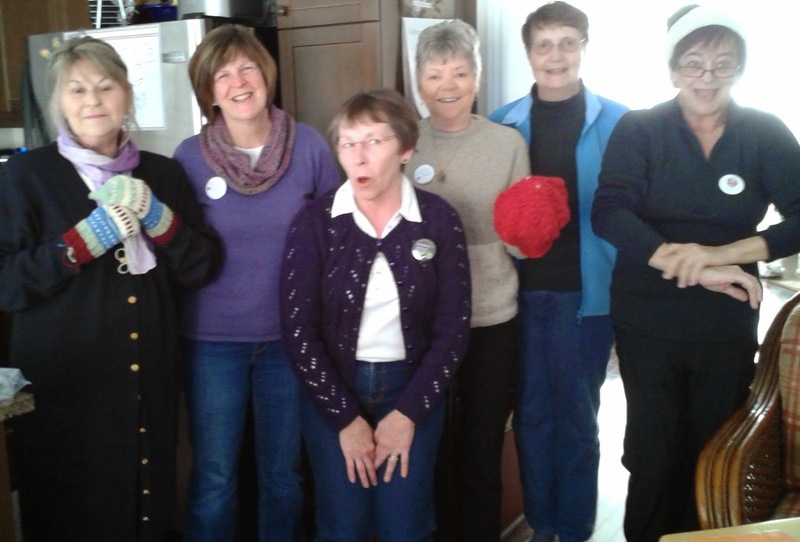 Today was a big 'show and tell' day at knit group. 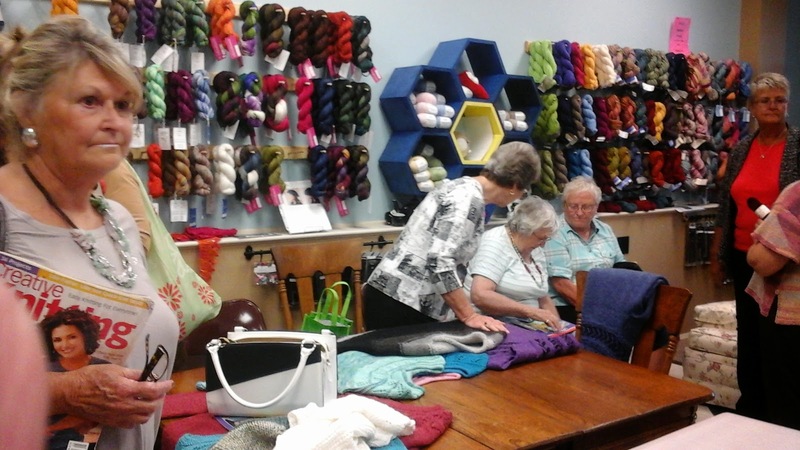 We had all been given strict instructions by Sandy to bring our Knitters Fair purchases to show her. 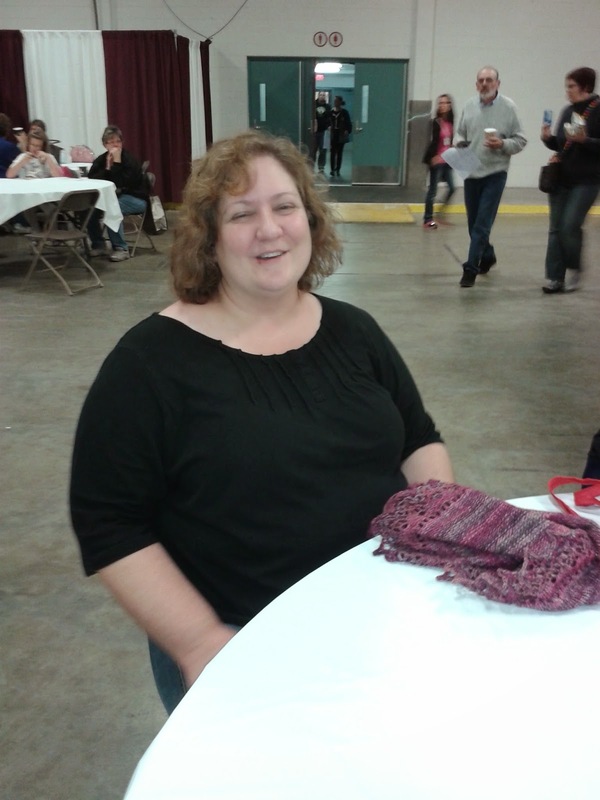 Sandy, one of our most enthusiastic fair go-ers was not able to attend this year. Sandy's daughter is having a baby - any day now. Sandy's son-in-law works in Fort McMurray. Sandy then, is on call to take Mom to the hospital. Which meant Sandy had to miss the Fair. Beyond all those purchases, there were knits to show. 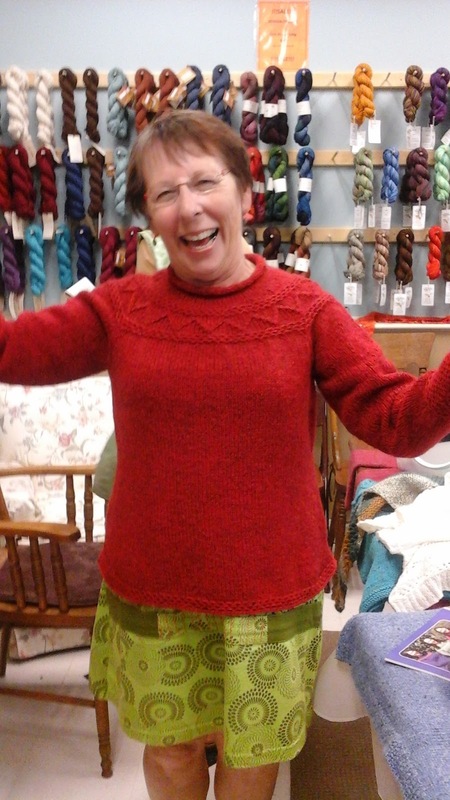 Sharon R wore her first-ever sweater to show us. Well done, Sharon. Great seams, great knitting, great fit. Not many knitters could lay claim to such an expert knit for their first sweater. 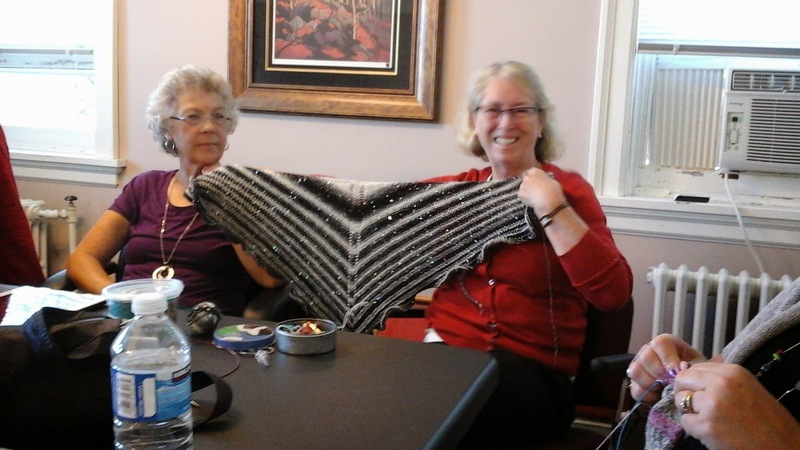 Sharon showed off the beginnings of her shawl. Called Bling and purchased last Saturday, she is getting ready to gift it for an early Christmas with ??? - better not say as you never know who reads this. 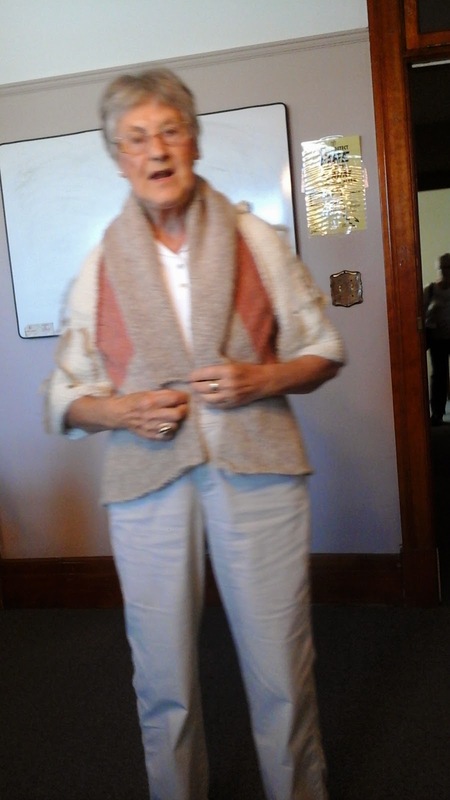 Wilma showed us a cute little sweater. 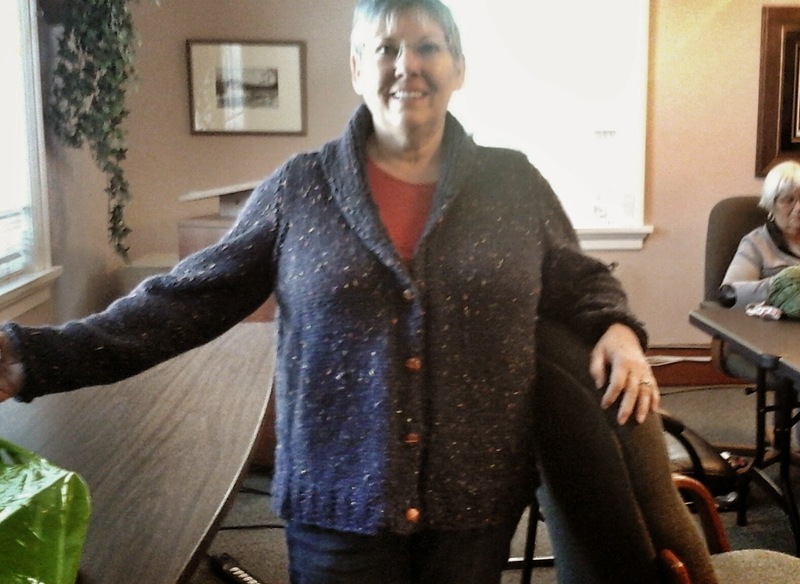 A Cabin Fever design she knit to use up stash. 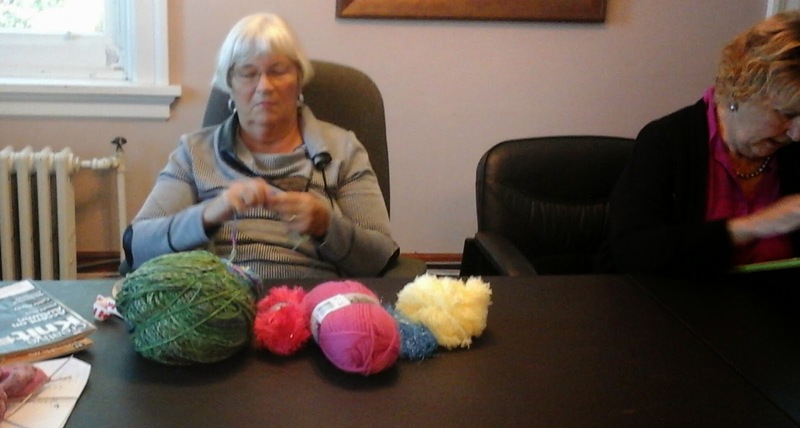 Carol is working with a great variety of yarns. Knitting first one, then another. What is she knitting? A 'Three Scarf Sweater' she says. More than that she wouldn't say I couldn't find it on google or ravelry so can't wait to see yours, Carol. Look what Sandy is thinking of knitting. 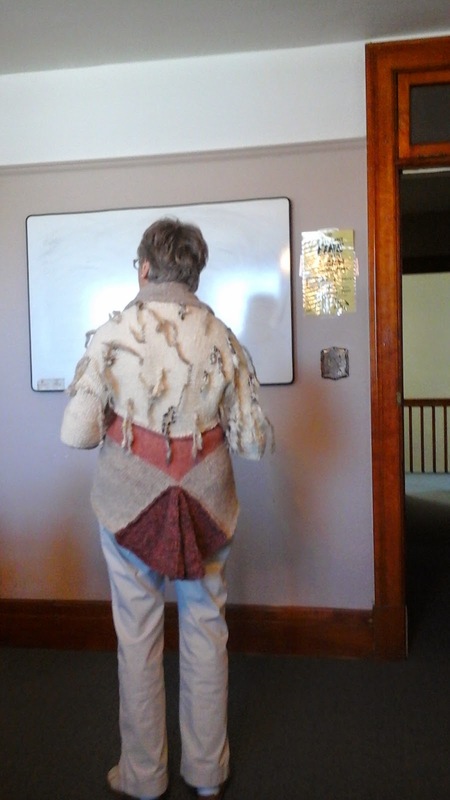 She also showed us a pattern for a great cowl. Called the Chunky Circular Scarf on ravery, it uses 5 strands of DK weight yarn, held together. Now isn't that a stash buster. We think we'll do a KAL for the cowl, before Christmas. Lots of projects, lots of colour, lots of inspiration. 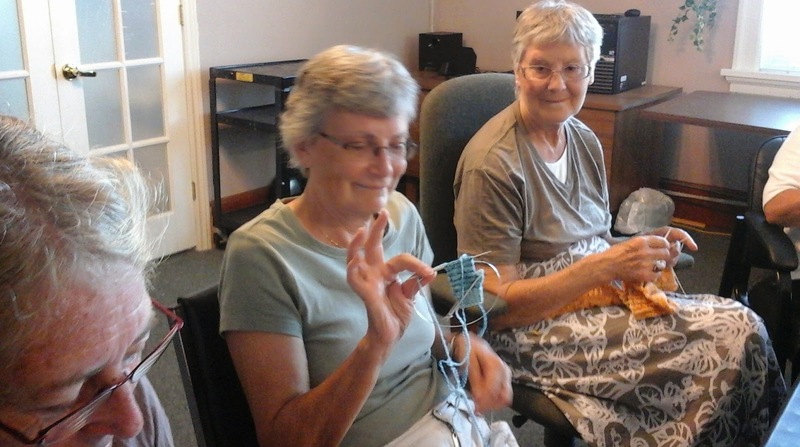 Another great knitting day. My off-white, top-down Radicchio, although a speedy knit, won't be ready for late summer wearing this year. It will be next summer's go to piece. I ended it with the same trim as the top - 2x2 rib. Most of the trim - I worked with a slightly smaller needle - 3.75mm versus the 4.5mm used in the body. But I switched back to the 4.5 for the cast off. 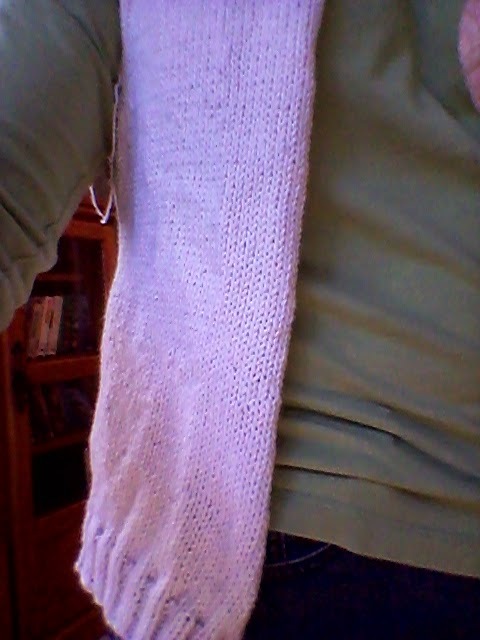 The cast off was done in pattern with an extra stitch made and cast off every once in a while - A- La Jenny's Surprisingly Stretchy Bind Off. No use going to all the trouble of inserting 'fit my hips' increases then having a trim too tight to meet in the middle. But if not, it's top down. Easy to Fix. On to the sleeves. 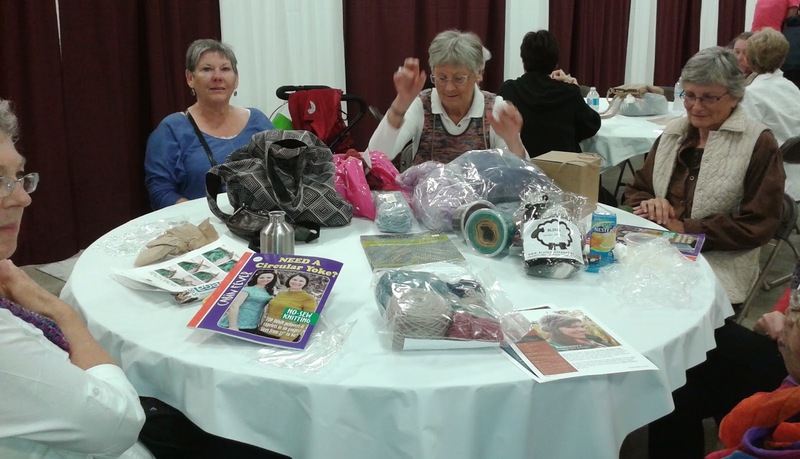 Christmas In September or Christmas For Knitters is the way knitters often describe the Kitchener Waterloo Knitters Fair. 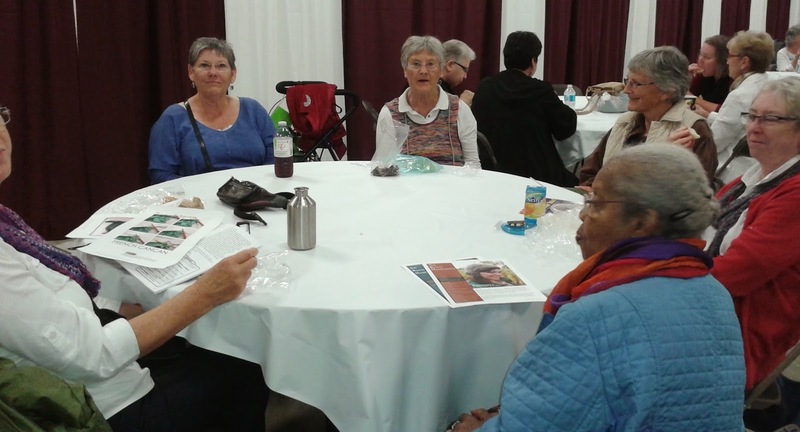 Saturday was fair day and my Meaford Group took 2 cars and 6 knitters down to smell the yarn fumes. We were anxious to see what the KW Guild was offering for 2014 as last year, the first year in 'The Aud' as the grand old arena is called, was such a disappointment. Accustomed as we knitters were to the ballrooms, carpeted halls and fancy washrooms at the previous location, we all found the arena to be a let down. Crowded. Poor food. No seating. Cement floor. Arena washrooms. Of course, nothing could be done about the washrooms or the floors, but otherwise the Guild had made changes to make the day a much more positive one. Two venue spaces versus one eliminated the crowding. Large areas with tables and tablecloths set aside for lunch and sore feet. 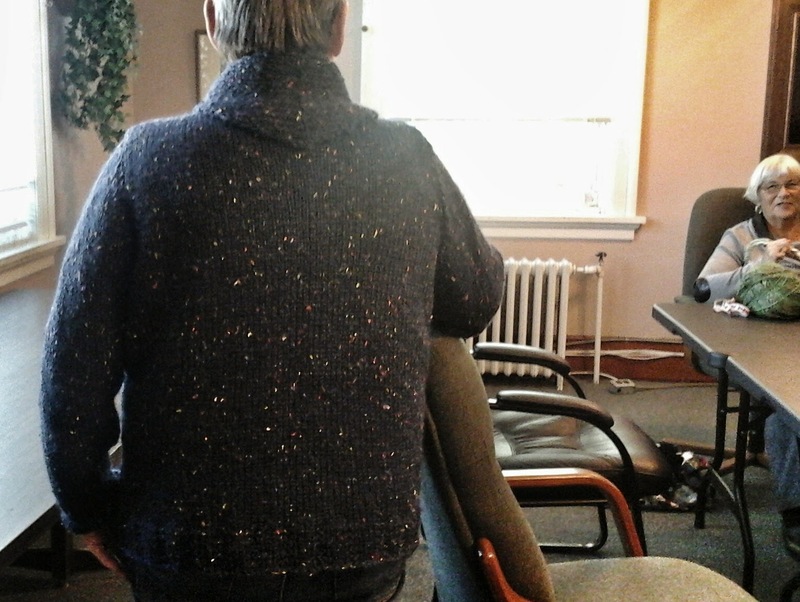 A spa where knitters could get their nails polished and take a class in chair yoga. Those are my nails, calling out for a manicure. 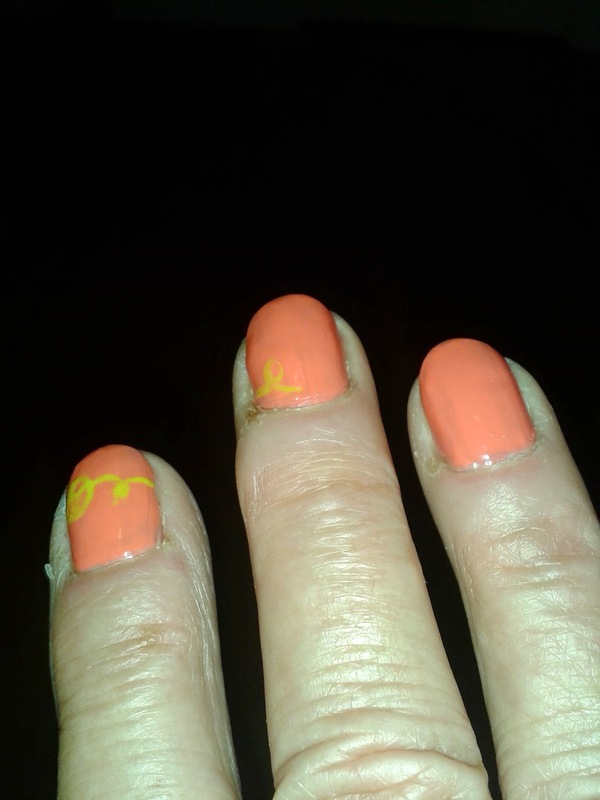 The little squiggle painted on the index and middle finger is a ball of unwinding yarn. Fashion shows and speakers on the same floor as the show. All in all, well done, Kitchener. Our group certainly enjoyed our day. Were there purchases? Oh Yes. And my purchases were exaactly opposite to what I normally buy. Normally I say the Fair is not for bargains. Rather it is for great, unusual product not seen every day in every yarn store and all under one roof. But this year. I got bargains. One skein Americo Cotton Flamme. $10. Half price. To be used for ??? - probably a scarf, shawl or wrap. One skein Super 10 cotton. $5. 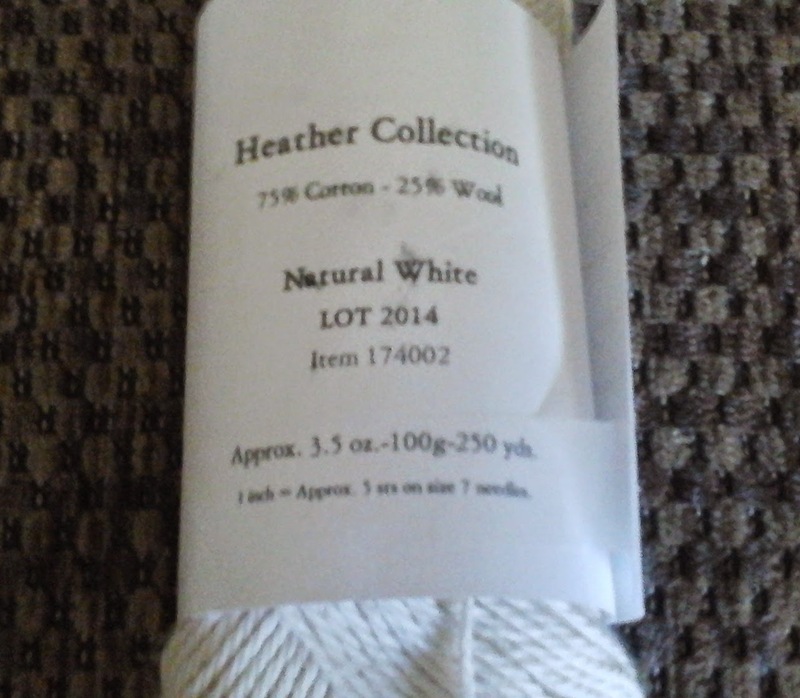 Same colour, same yarn as I purchased locally last week for $15. To be used in a summer skirt I have planned. One ball of Sock yarn. 100 G $8. Half price. One an impulse buy, but the Barbara Walker book has been on my list FOREVER! A bit of star gazing as we were greeted at the door by Sally Melville! Always fun. Good friends to share the drive and the day. 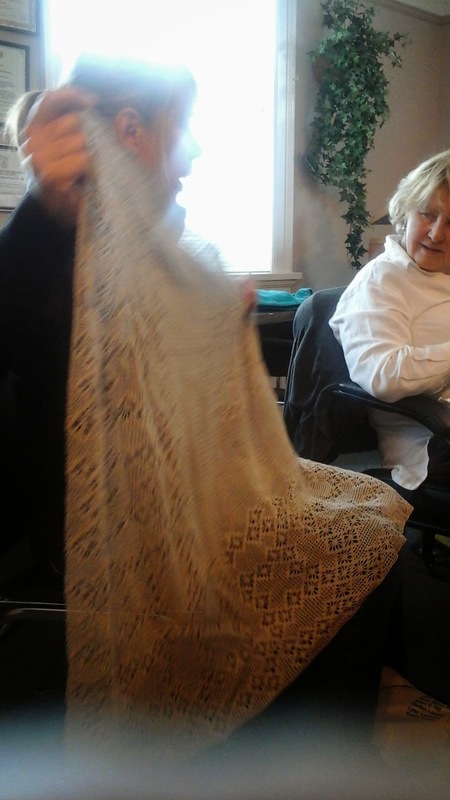 I would say weird and wonderful things were shown at knit group today except that would be wrong. They were not weird. At all. But beautiful. Sandy arrived with a finished outfit for the new grand daughter to be born within the next two weeks. All pink and cute. That ultra sound better be right, Sandy said. Sandy has the best suggestion for knitted baby garments. Buy matching pieces to complete the outfit. 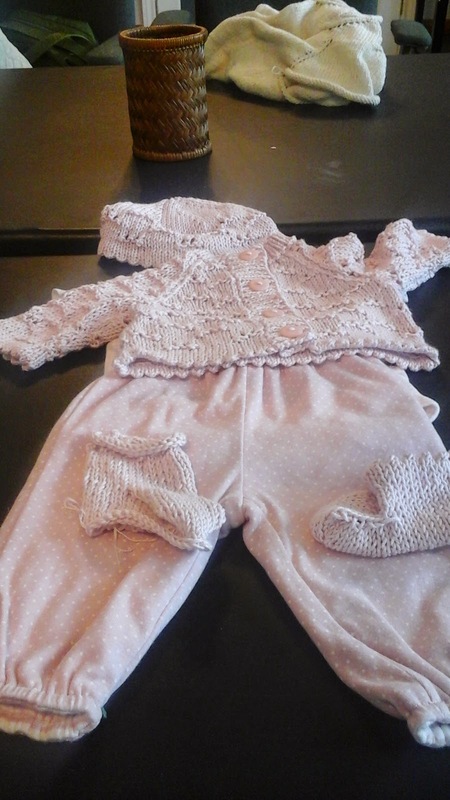 She says the Mom is much more likely to put the hand knit pieces on the baby if there are bottoms to match. Great idea sandy. 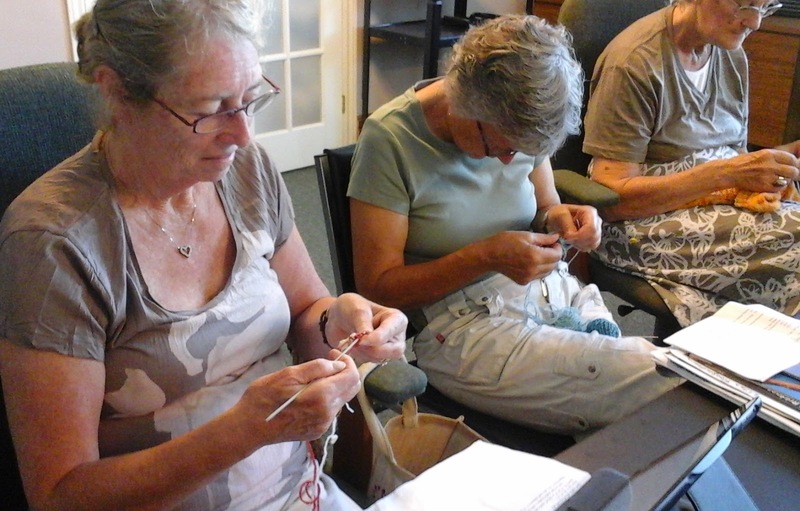 Nicki, who we haven't seen much this summer, came to knitting with a crocheted piece she started a long time ago. Decades ago she said. 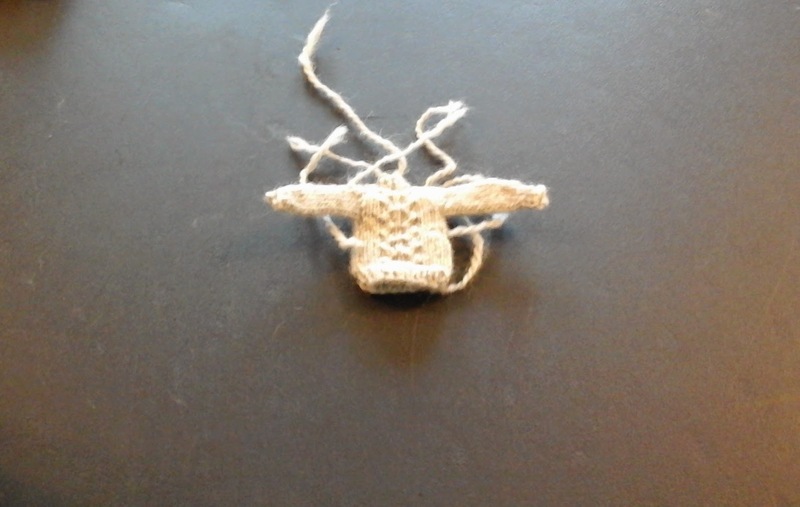 Crocheted with gossamer thin thread and very small needle. Take a look. This is the type of work, I would never even think about doing. Well done, Nicki. Sandy's sister Sue, bag lady Sue as we call her, has discovered a source of great knitting bags - Graces Cases - and had one made for Sandy. 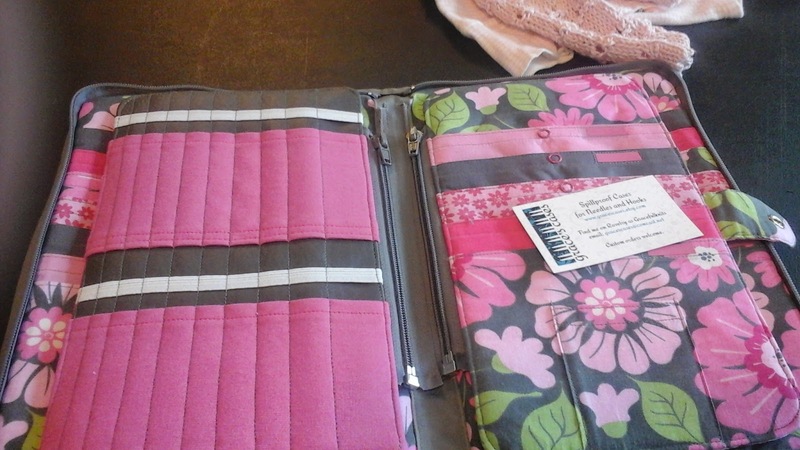 You give your wants/needs to the seamstress, choose your colours and she creates a fantastic, one of a kind bag. Grooves for needles and pockets, pockets, pockets. All these things zipper out so you can carry them separately if you want. 'Silly expensive' for a knitting bag, said Sandy. Not considering the detailed work. 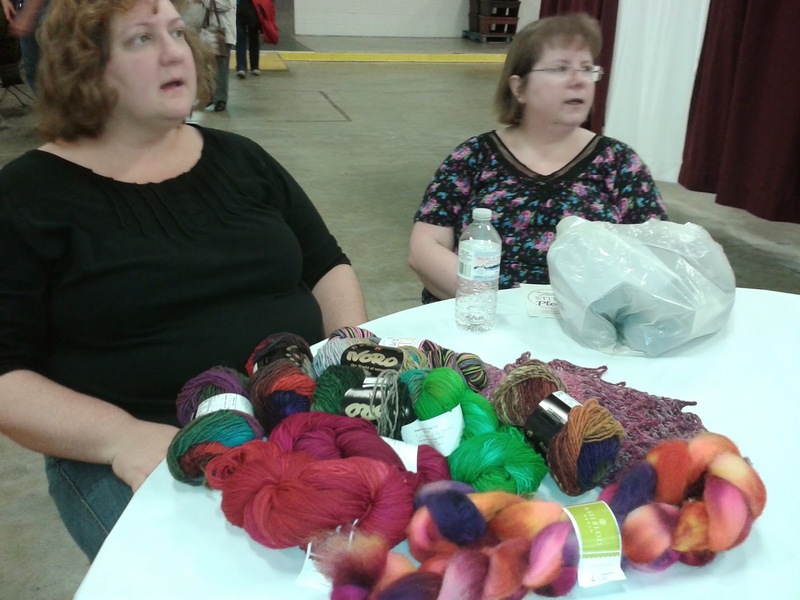 And the excited talk today was of the Knitters Christmas Fair in Kitchener this Saturday. Two cars of us head down this year. Before I came home I went to the bank. Got my cash, got my list. I'm ready. What is a trunk show? In knitters' parlance, at least, a designer packs his/her trunk with newly -knitted garments, drives to meet up with a group of knitters, opens the trunk and shows off the knitting. 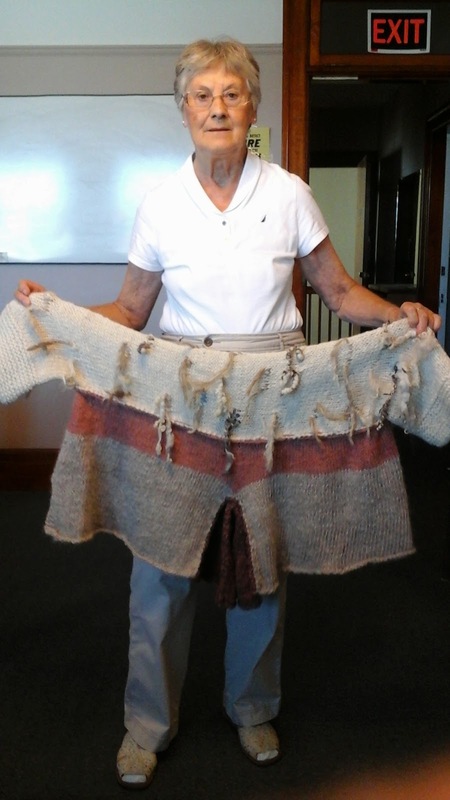 Or in the case of Purl 3's trunk show with Deb Gemmell, the garments were brought into the store. 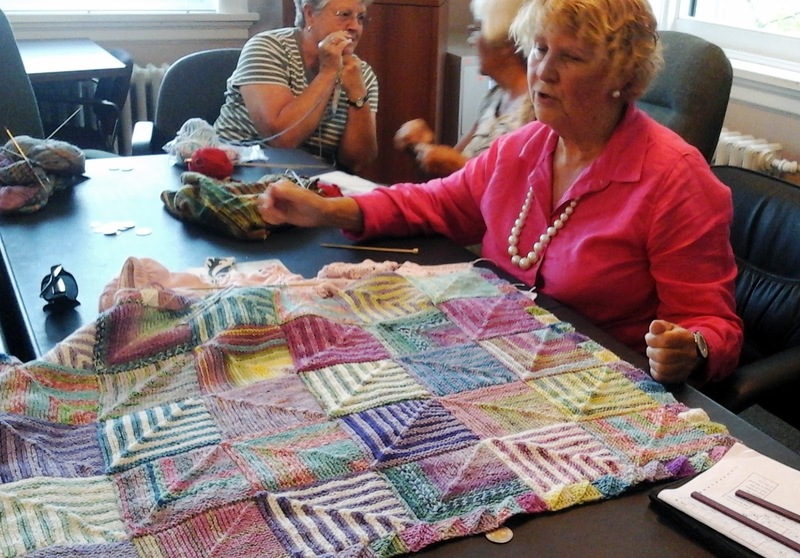 And despite the late summer heat, all the knitters took turns wearing the newly-knit, Circular Yoke, wool! sweaters. Worn at least long enough to check themselves out in the mirror. Worn atop a sun dress! What a fashion plate am I! Carol below, much more fashion conscious than I, does not look impressed. Next time you are invited to a trunk show, don't worry about your hair. Don't worry about your clothes. They dress you when you get there. Radicchio is speeding towards the finish line. So very quickly it seems. 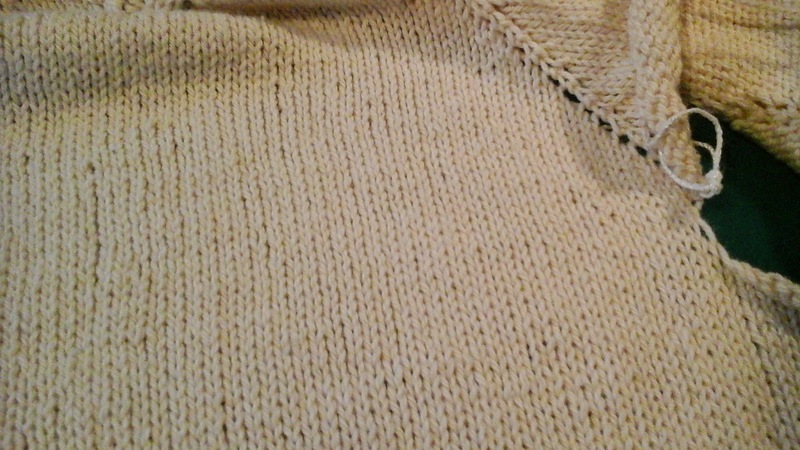 I had forgotten how fast top down, stockinet sweaters are to knit up. And Radicchio being a cardi, there is even the stop & turn pause at the end of each row. Usually I take advantage of that pause to gaze around, get a drink, have a snack, or generally otherwise waste time. 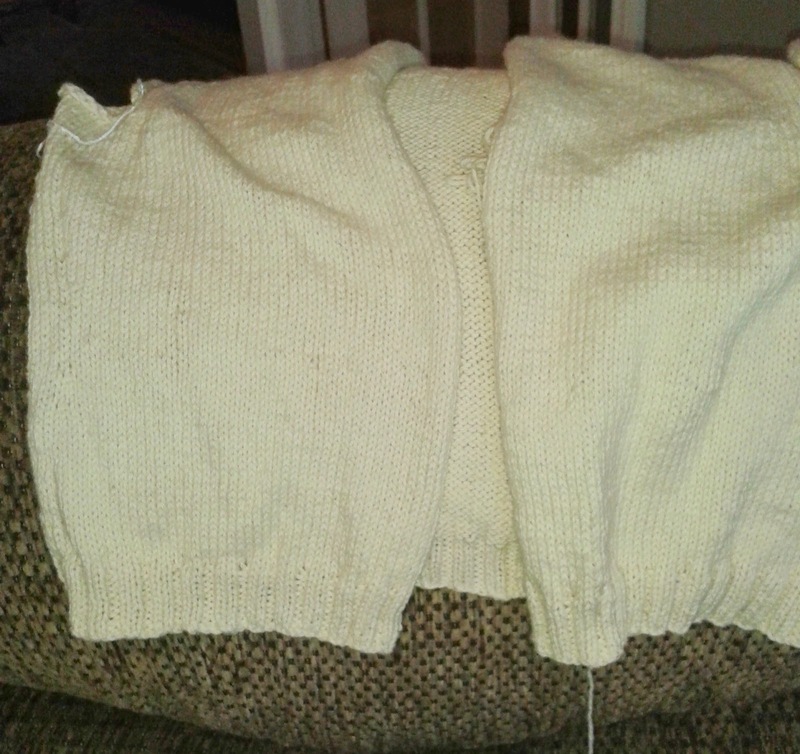 Still, this cardi is nearing the finish line. Right now I am at 21 inches top to bottom. 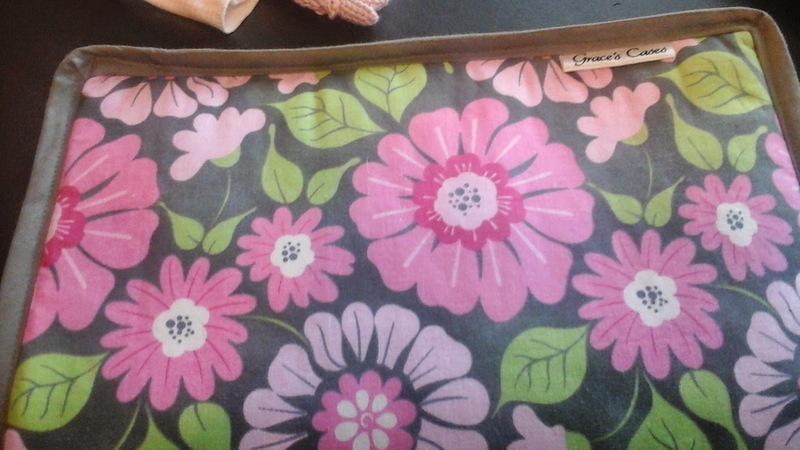 My goal is 23inches total, with about an inch and a half of yet-to-be determined bottom trim. So another half inch of plain, then on to the trim. Then the sleeves. I hope not to get marooned on that island. 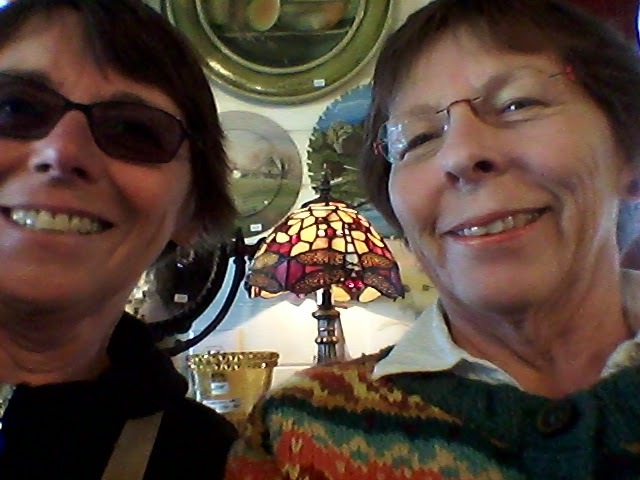 and I struck out for Orillia, a new yarn store and a trunk show by Deb Gemmell. 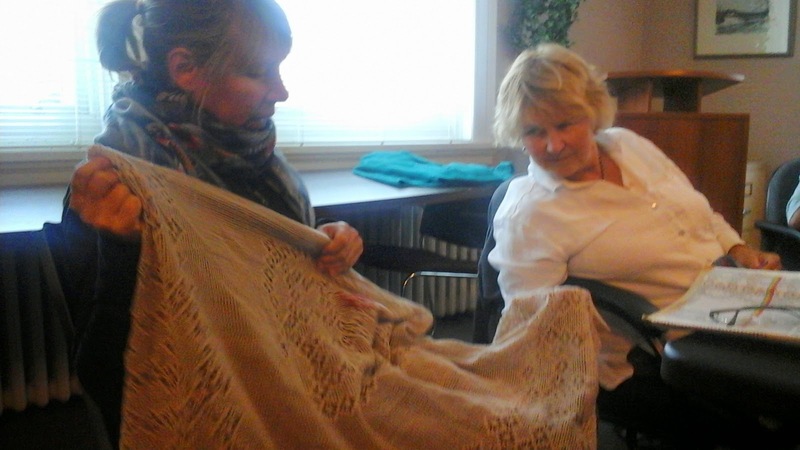 We had Fun with a capital F. Lots of laughs, lots of yarn and what I learned! books, this one covers several yarn weights: from sport at 24 stitches through 22, 20, 18, 16 and up to 14stitches over 4 inches. That means, in case the logic escapes you, that any yarn from sport to chuncky that you might have in your stash or see on the shelf will work for each and every one of the designs in this book. If you check out this book by flipping pages looking for 'a pattern' you will be disappointed. That is not how the Need a books work. 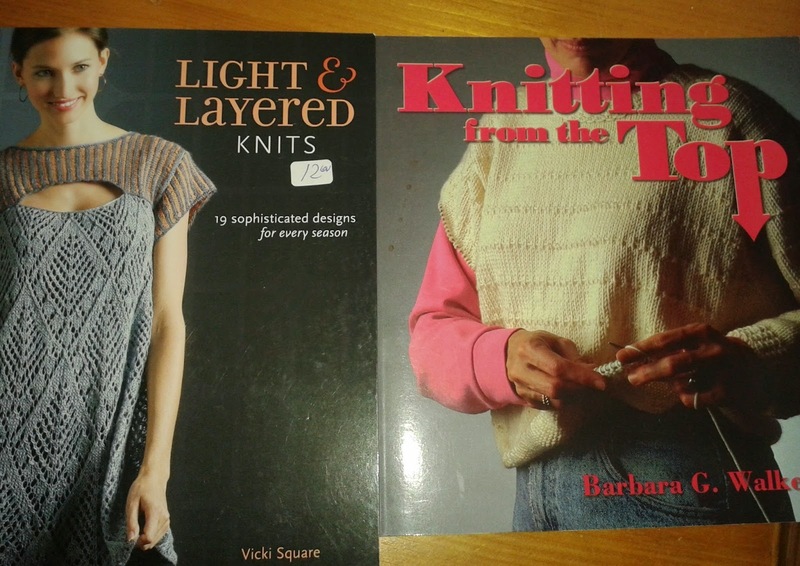 Instead, these books are not so much pattern books , as books with lots of design ideas and multiple choices that allow you to knit something that is exactly what you envision. No designer ideas are ever imposed on you by my friends at Cabin Fever. Page one of NaCY shows this little box of information. That pretty well says it all. Read the book like a novel, make your choices, then knit the sweater of your vision. 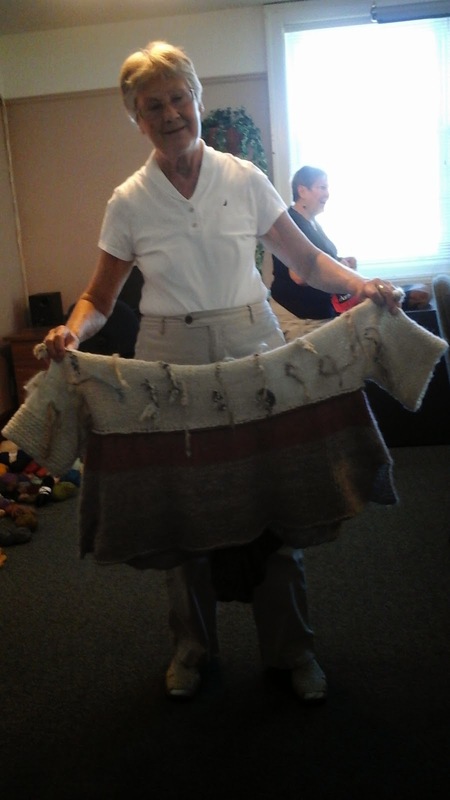 Deb used these short rows to raise the back neck of the garments in NaCY. And I would have to say they are the neatest - as in tidiest AND coolest - short rows I have ever seen. 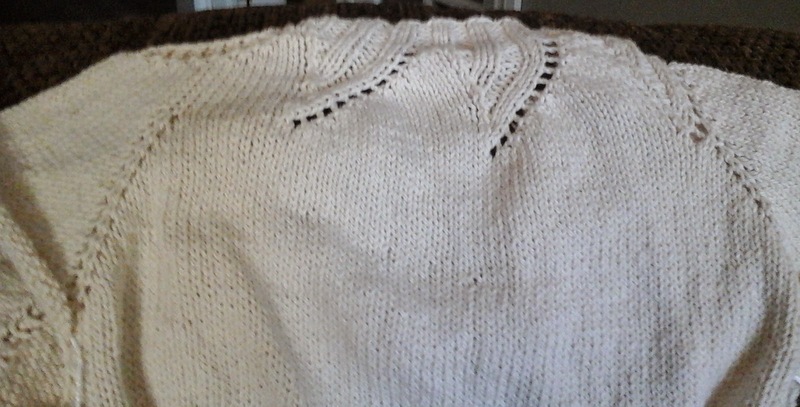 My Raddicio was past the back- neck portion when I learned of Twin Stitch Short Rows but I always place a couple of short rows on the back body of my sweaters to accommodate my dowager's hump and used the Twin Stitch type to do that. You can see it here. Or rather you cannot see it here which is the beauty of them. Deb also used a variation of the TSSR for the bust shaping darts in NaCY. Happens that I was right at bust level with Raddichio so I incorporated them in my sweater. In NaCY the knitter is given several choices for waist shaping - yes/no, a little/a lot, with hip shaping/without hip shaping - and I chose yes, a little, with hip shaping. Most patterns have this shaping done at the side 'seam' marker. 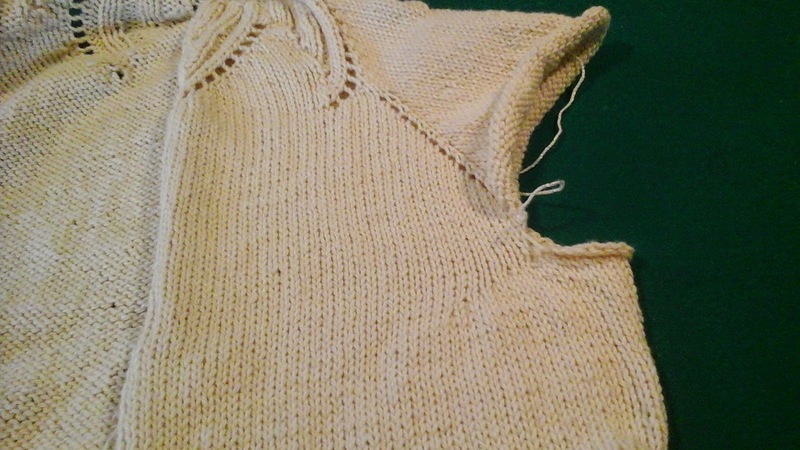 Deb instead has the shape lines separated by a few inches of under-arm stitches. Being separated makes them much easier to work which in turn makes them look much neater and nicer, I think. Deb, IMO is a technical genius and we in Ontario are lucky to have her. 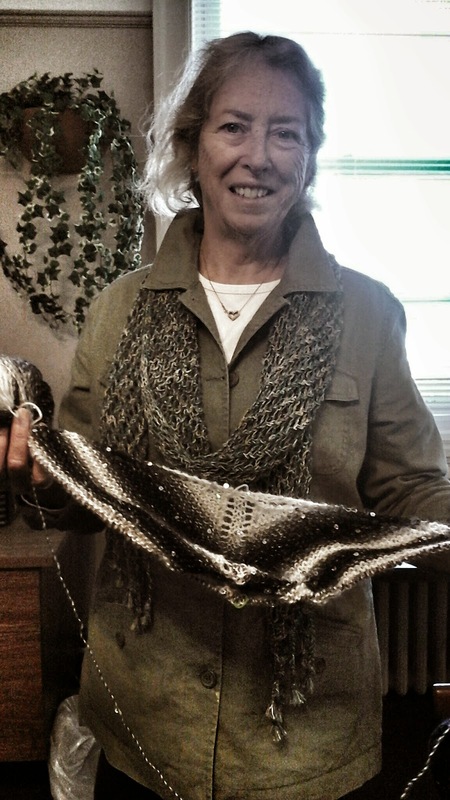 She earns her living through designing patterns, writing and teaching about knitting. 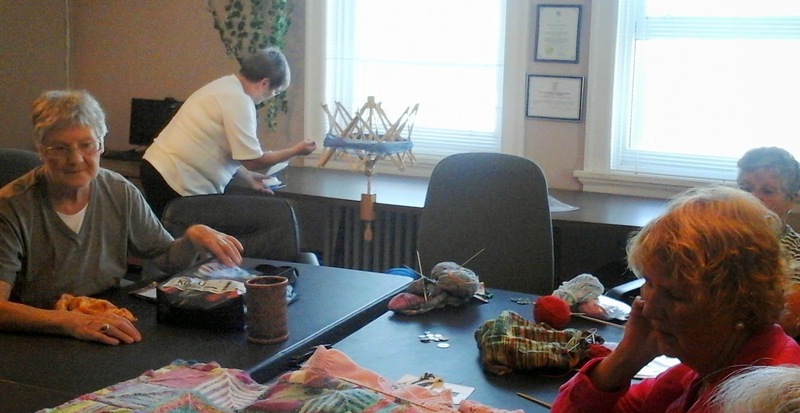 If you have ever heard her speak/teach the impression she leaves is that her overriding passion is to help make every knitter a better knitter. Thanks, Deb. Summer has finally arrived in Meaford. 30' temps today with a feel-like temp of 36'. Too bad its September. And good thing the library has AC in our meeting room. 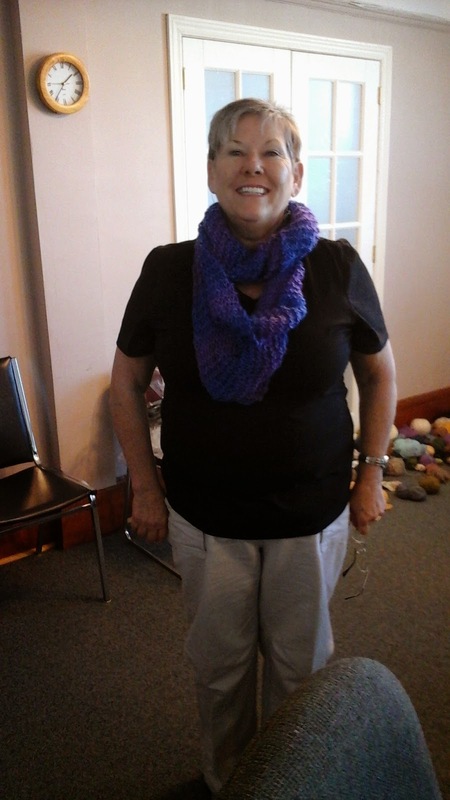 Sharon is a knitter who barely knew needles from yarn a year ago. This is beautiful, Sharon. The colour gorgeous. Sharon learned another new skill today. This is her first time using a swift. Sandy B is going to be a Grandma again. Any day now. And what grand child of Sandy's would be happy without a mitred square blanket? 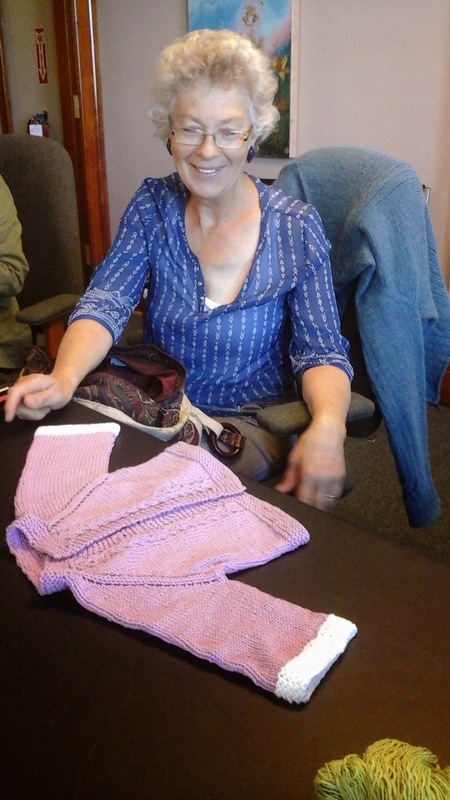 This one knit with many shades of lilac - just like the nursery. 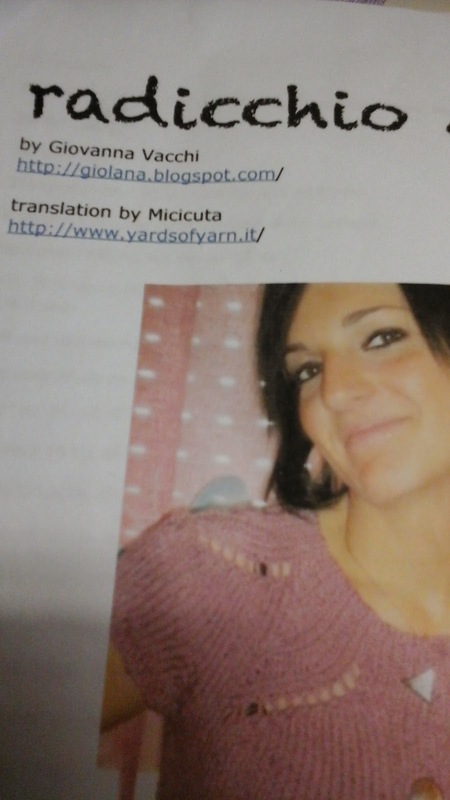 ( I wonder which knitter supplied all that lilac yarn?) Sandy calls this her mindless knitting. Pure genius, I say. 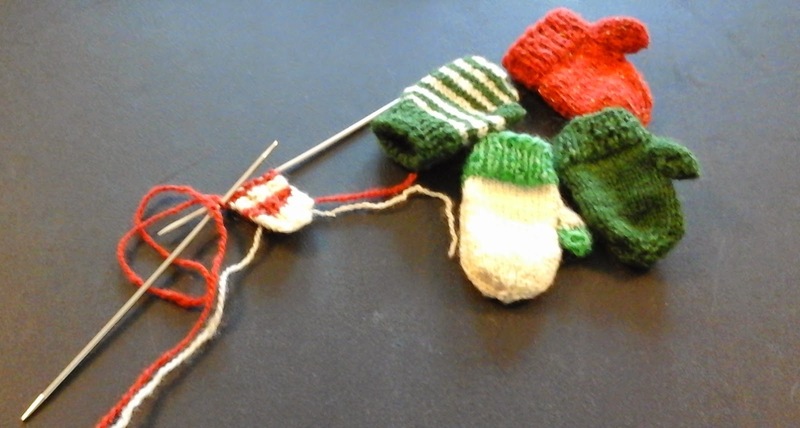 Despite it seeming like mid summer and despite it only being September, Sharon and Jean are working hard on the teeny, tiny knits for the Christmas tree display at their annual spinners and weavers sale. Look at that level of concentration. Remember this is the spinners and weavers Guild they are working for. SO - all yarns are hand spun. Here's Jean with a little mitten. to go with all these other little mittens. Off to the left you see the matching scarf. That would be scarf with cable. Hand knit. Hand spun. Teeny Tiny. Then look at this little sweater. With that great stitch pattern centre front. Hand knit. Hand spun. Teeny Tiny. I would need new glasses - or new eyes - to do this work. Too hot to garden. Must be knitting weather! At least, one would think so by seeing all these wonderful pieces. For me, with fall, comes routine and routine means knitting. The answer to "What's on your needles, Brenda? is this. Started on the trip home from the trailer and despite canning activities taking time from my knitting, nonetheless, progressing nicely. This is a top-down, summer cardigan. 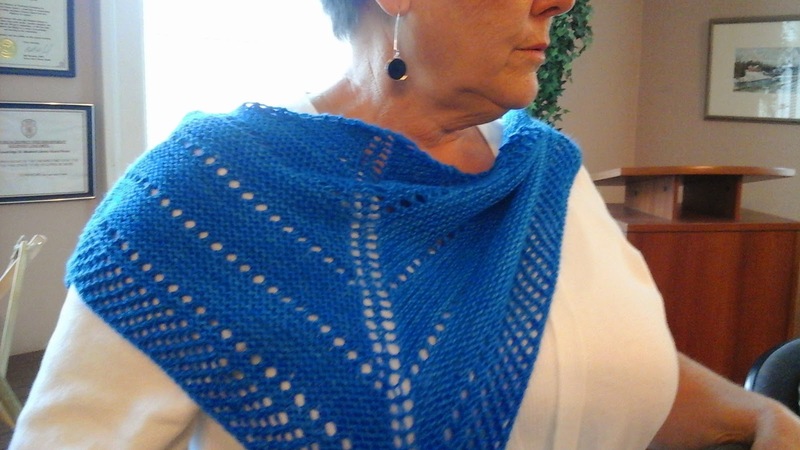 The pattern, Raddichio, is a ravelry freebie. 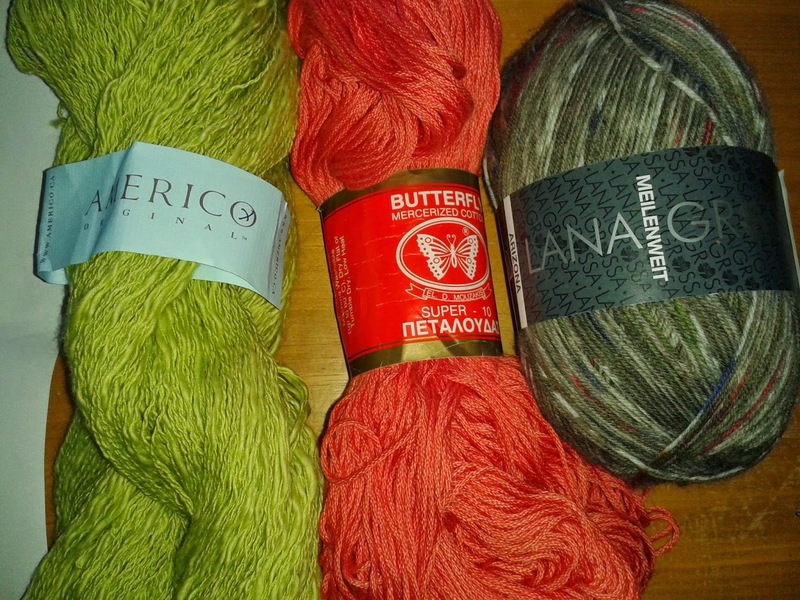 The yarn, I purchased in Baltimore this spring while at the Marylalnd Sheep & Wool Festival. 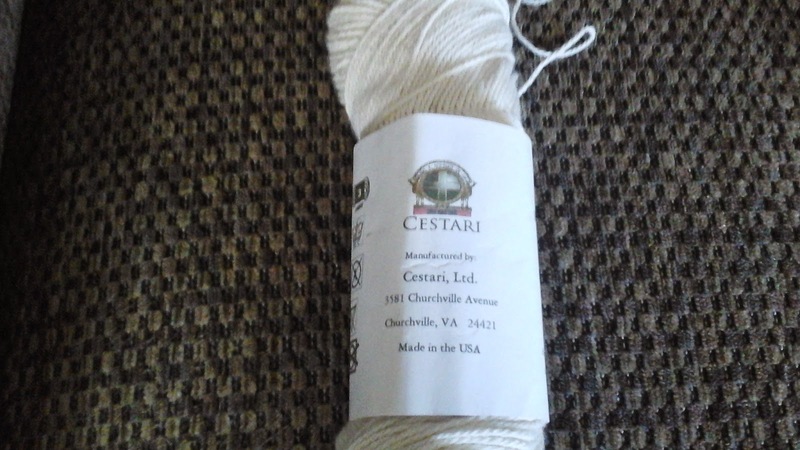 with the wool portion coming from the sheep at the Cestari farm. Cotton with a bit of wool, I always feel is a great combo. Cotton for the cool, breathability it offers for summer. 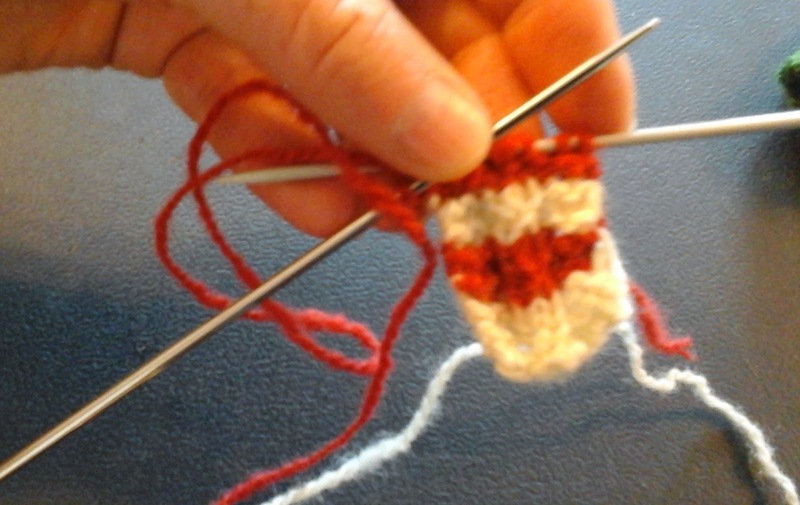 A bit of wool to help the cotton hold its shape. Perfect. At the moment, with the lace yoke complete, it is a no-brainer of a knit. That works perfectly for a carry-along, or an in-between jobs kind of project. Right now, I am about 6 inches below the great divide of sleeves from body. 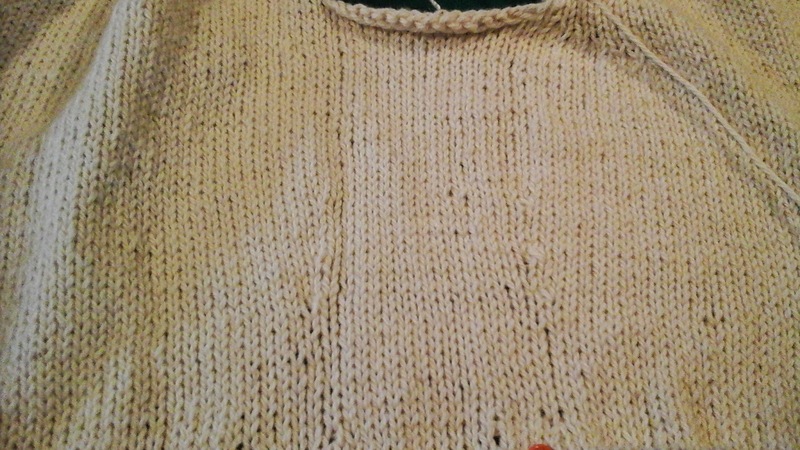 I have inserted two rows of shaping so far and am headed for the waist. There are a couple of unique features I have included in this sweater. 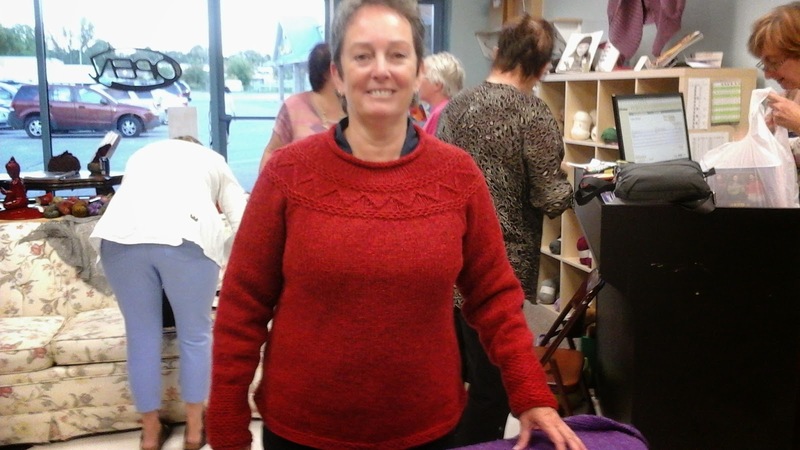 Features, new-to-me until last Wednesday evening when I attended a trunk show where Deb Gemmell, introduced her latest book - Need A Circular Yoke?. Deb's technical genius was at work again when she wrote this book. New and improved bust shaping and a new-to-me way to short row are just two of the 'A-HA' items for me in Deb's new book. Consider this a 'trailer'. I'll tell you all about those new techniques tomorrow.